The F-14 was developed as a result of the Navy's experiences in Vietnam as well as the need for a next generation fleet defender. Thanks to the failure of the F-111B, a misconceived aircraft that shows why politicians need to stay out of the armament business, it already had its main armament, the very long range Phoenix air to air missile and its high output radar that was capable of tracking and locking on to multiple targets. Just the thing for fending off the expected Soviet bomber stream. At the time variable geometry wings (swing-wings) were seen as a way to provide the ability for low speed landing, something crucial for carrier operations, with the ability to go very fast. Thanks to Grumman's work in developing the feature for the F-111, they knew how to set up a system that works. The system was infinitely variable and thanks to an on-board computer, would automatically sweep the wings forward when needed for dog-fighting. Like all new technology, the aircraft had its teething troubles and was saddled with an underperforming engine for much of its life. It wasn't until the later F-14B and even later F-14D that the Tomcat had everything it needed. Unfortunately, short sighted politicians were at it again and while many aircraft were upgraded to B and later D standard, the build program for the F-14D was halted after only a few dozen were built. The F-14 was later replaced by a multi-mission plane, the F-18F, which meant that it did everything; a jack of all trades, a master at none. The Tomcat is now history and will be very much missed by many, including the crews that used to fly them. 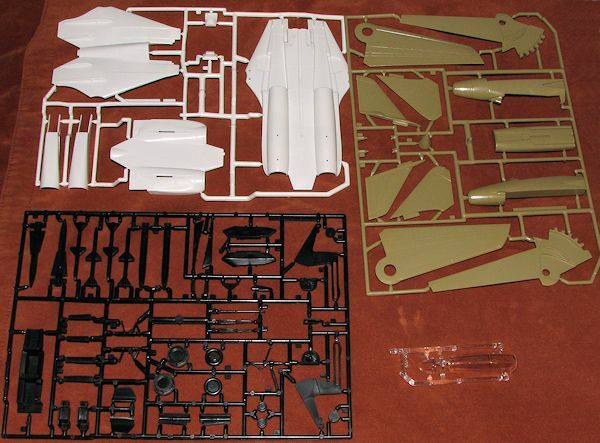 In a recent discussion on the Forum, I was reminded that Matchbox did an F-14 kit in 1/72 scale. I had never actually seen one built and had often passed it by when shopping for Tomcat kits. When the LHS had one from a collection on sale, I figured I'd pick it up and see what I missed. According to a slip in the box, it was missing its crew. It is also missing the display stand. Everything else is there, resplendent in its three colors, as befits a 400 series kit. One look at the sprues confirmed that this was a very early Tomcat and locating the 1976 production date on the side of the box only added to that confirmation. This means that it has the very early, broad rear fuselage extension and the very small seeker. 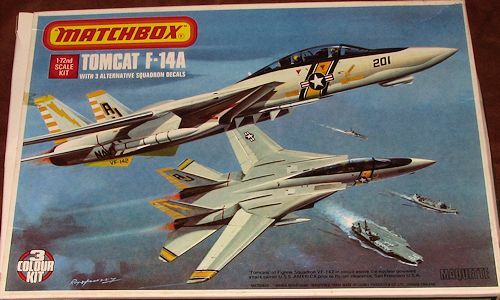 I am sure that Tomcat fiends could add more to it, but one has to realize that it is a Matchbox kit from the mid-1970 and not a kit that most would spend time on for a contest. Matchbox kits were designed to be assembled quickly so the pilot could spend quality play time with it and this one meets that requirement. The cockpit consists of a tub, two seat shapes, two crew members and two instrument panels. The forward fuselage is split vertically and the rear, horizontally. There is a lower forward fuselage section that contains the nose gear well and a small forward radome piece. Wings are upper and lower sections that are designed to mesh together with the help of a plastic track section that activates the small glove vanes on the leading edge of the wing. To my knowledge, only the even older Monogram 1/72 Tomcat has the feature. Like every Tomcat kit I've built or seen, the engine intake pieces are separate and have compressor faces at the end of them to prevent see-through. Horizontal stabs and fins slot into the rear fuselage as do the afterburner cans. Landing gear are adequate, but with wheels that are not even close to what the Tomcat uses. If you care about things like that, get some aftermarket. There are no Phoenix pallets and no drop tanks. One has only Sparrows for the centerline with the Phoenix going on the wing pylons. No Sidewinders and no rails for them either. Instructions are typical of Matchbox with first generation Humbrol paint numbers, though a generic name for them is also provided. At the time, all the painting information for everything but the outside was provided in a chart at the end of the instructions and this is just like those. Markings placement is on the back of the box and offers three light gull grey and white options. One is on the box art from VF-142 aboard the USS America. Next is a VF-2 plane from the USS Enterprise and finally a VF-32 plane (incorrectly identified as VF-132), from the USS JFK. All have a black surround to the cockpit area that will need to be painted. The decals probably worked well forty years ago, but were not only damaged, but are undoubtdly inert as well. 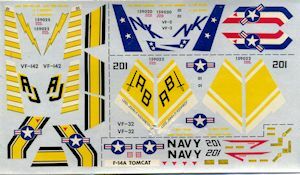 Fortunately, finding early Tomcat decals is not difficult, though the ones on the box art with the black and yellow stripes may well be as that was a rather short-lived scheme. So there it is. Of course no 'serious' modeler would every consider building this one as there are so many nice Hasegawa boxings out there and even the newer Hobby Boss versions to choose from. Fortunately, I'm not very serious so may well give this one a go. Thanks to me for the preview kit. Scour the sales and vendor tables if you want to locate one.